After the mystifying Mystic Point, my family and I were welcomed by a familiar looking talking dinosaur toy. I'm sure you know him! He's Rex from Toy Story! 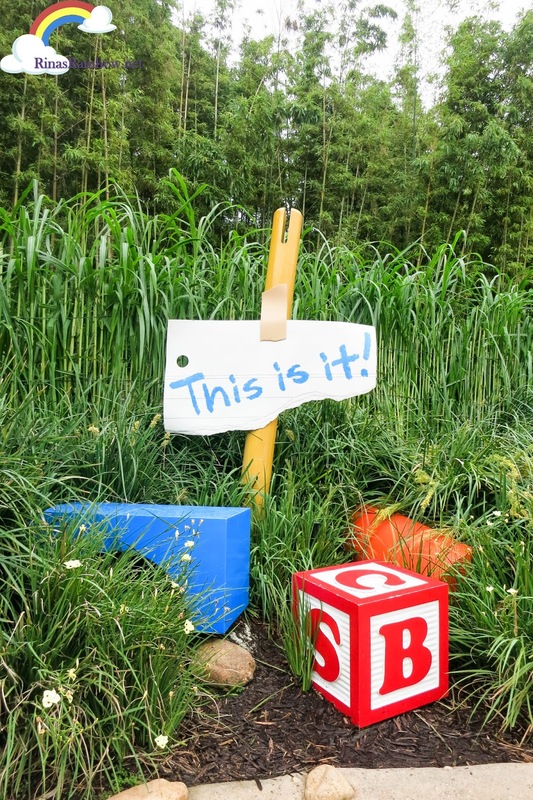 And all of a sudden we seemed to have shrunk into small toy-sized people walking around the huge backyard of Andy with his favorite toys all around us ready for some serious play time! 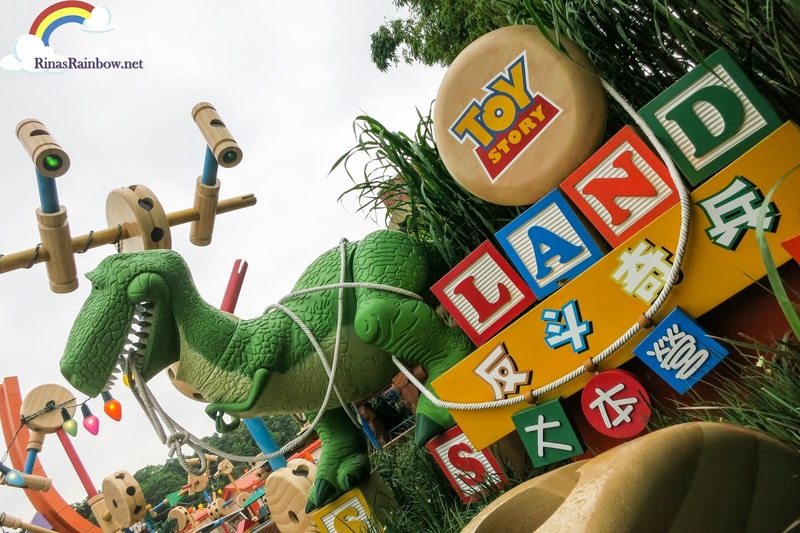 It really is a land of toys! I felt like my jaw hit the floor when I saw the amazing details of what it must be like to be smaller than your toys! 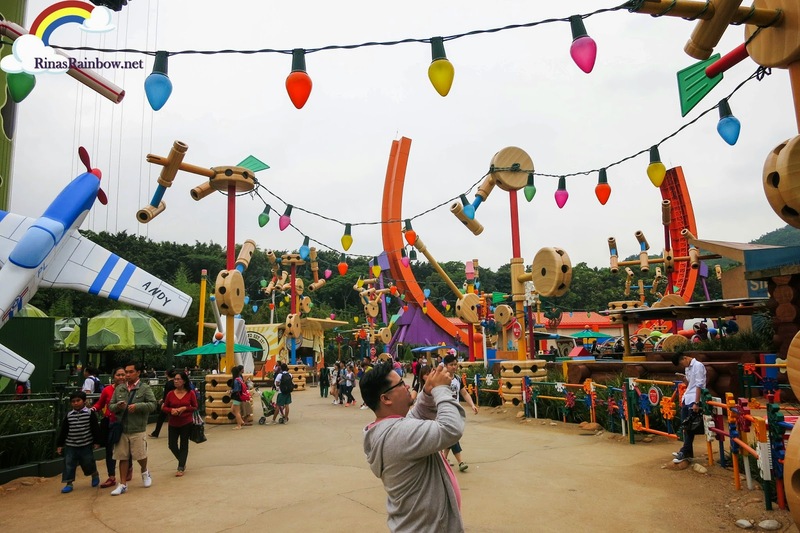 The first thing that caught my attention were the huge colored lights hanging all around onto some Tinkertoy construction parts. It was so pretty! It gave the place an even more festive feel. I've said it before and I'll say it again. 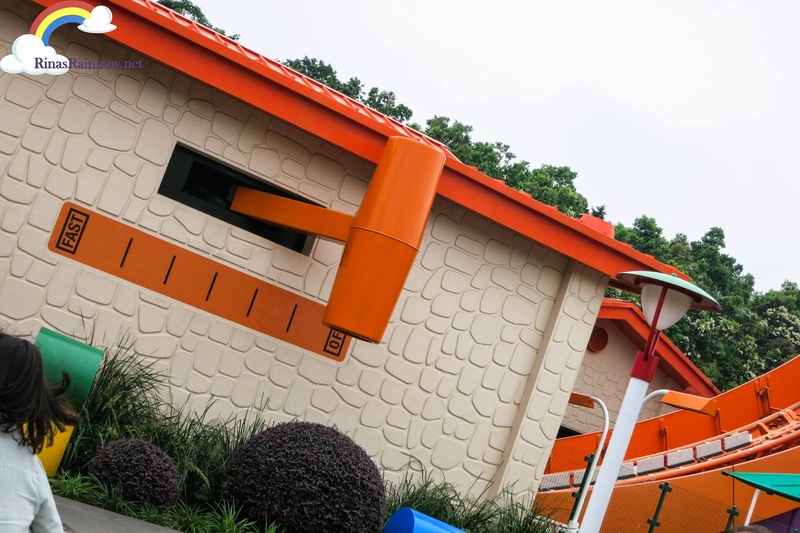 Disneyland's attention to details are remarkable! I really really felt like these were all real toys blown up x 100000. 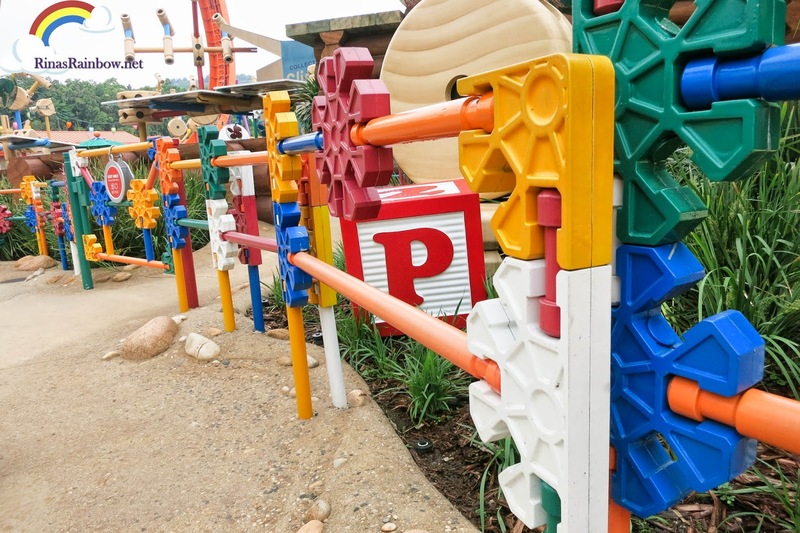 Even the fences really look like huge plastic erector set puzzles! 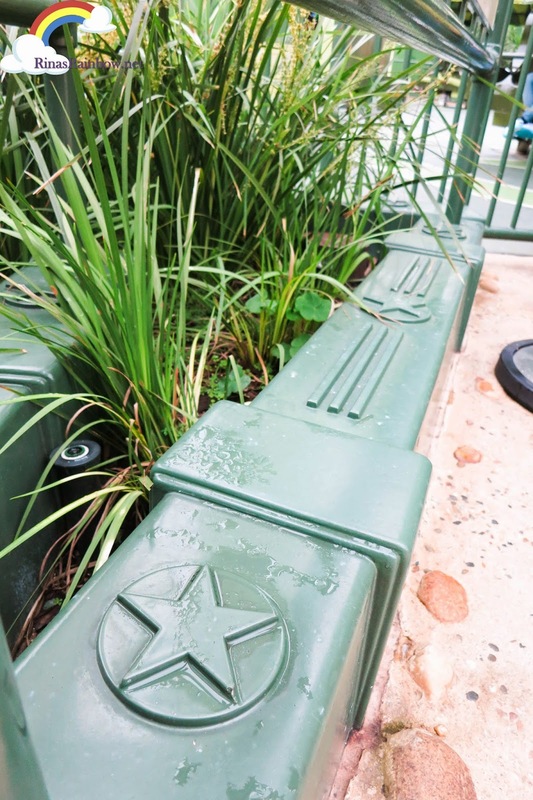 While the plant boxes by the Toy Soldier area looked like plastic military toy pieces! 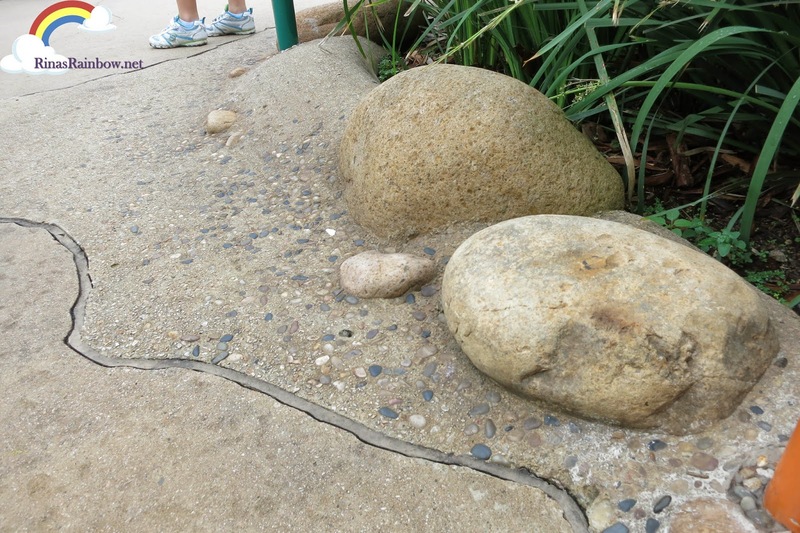 They designed the pathway to look like they have giant pebbles, adding to the gigantic backyard effect. 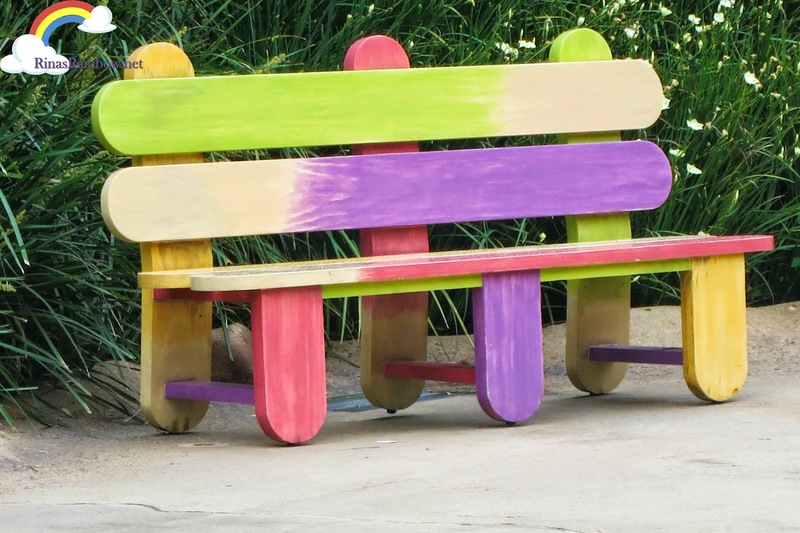 The benches are made of colorful popsicle sticks. 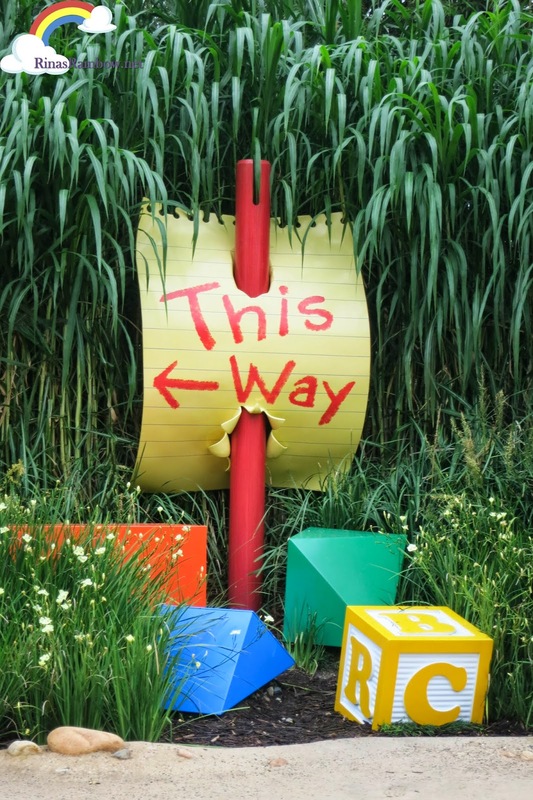 If you're coming from the other end of Toy Story Land (which is Fantasy Land), you will even see signs made up of gigantic straws, pencils, pieces of giant paper, with scattered gigantic blocks! 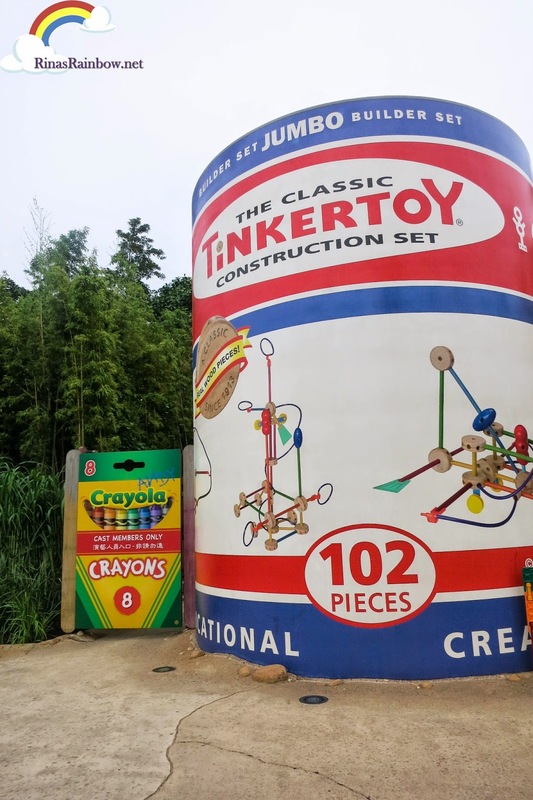 ...as well as the giant Tinkertoy construction set container and a box of crayons! And check out this giant baby monitor! The one that the plastic soldiers used to communicate with the other toys while they were spying on Andy as he opens his birthday presents. 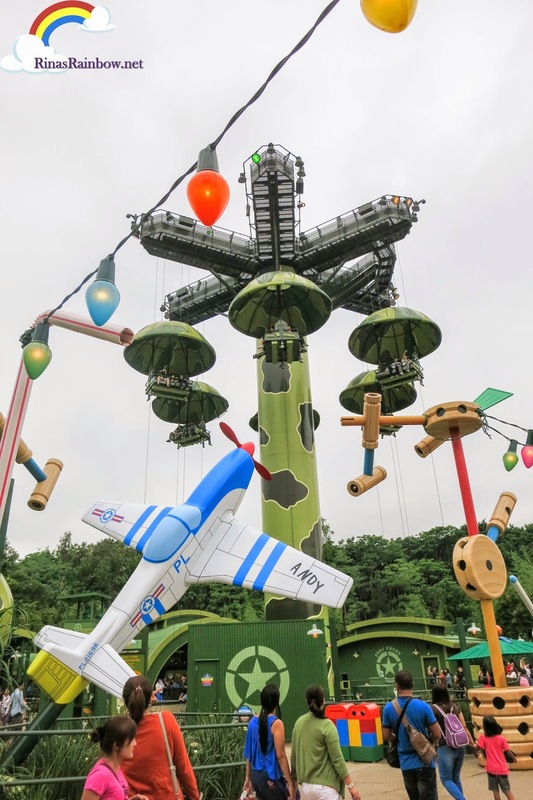 Speaking of toy soldiers, the Toy Soldier Parachute Drop is one of the most thrilling rides in Toy Story Land! 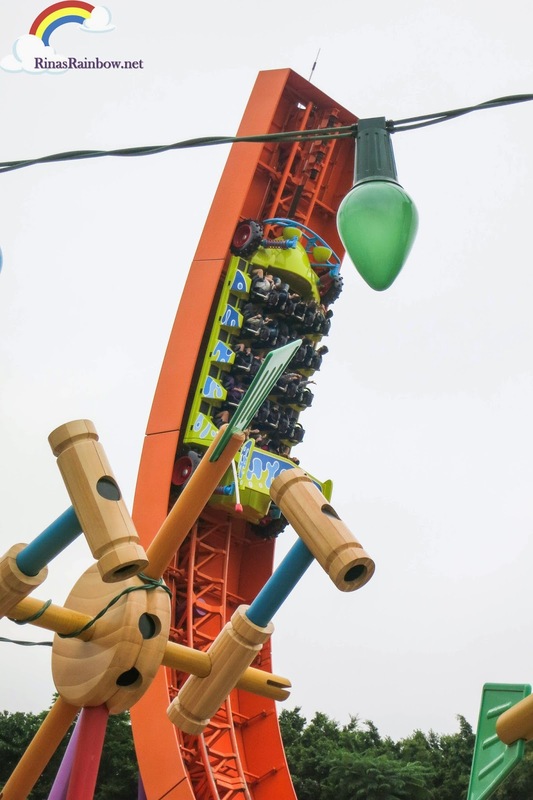 You go up up up into the air, enjoy the fantastic view before you suddenly drop down a few of times! 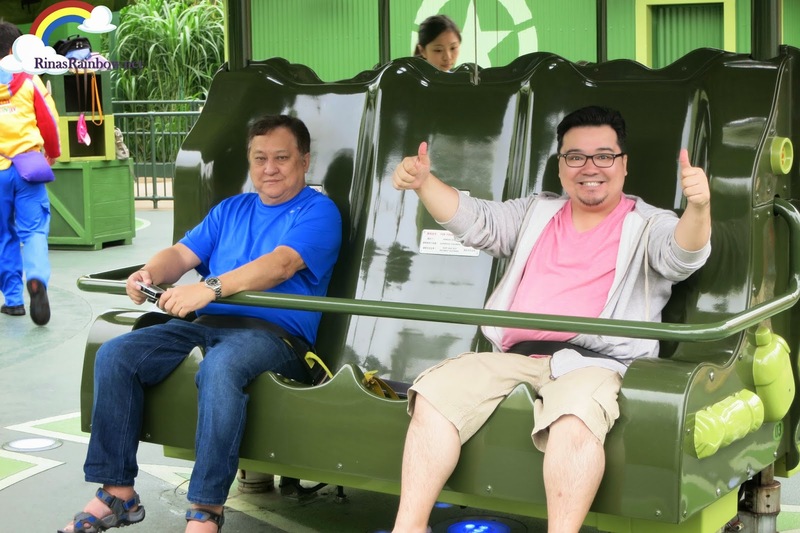 It was actually Richie who boarded this ride. I stayed behind with Rain but I didn't mind :-) I was already very much entertained just by exploring the place! 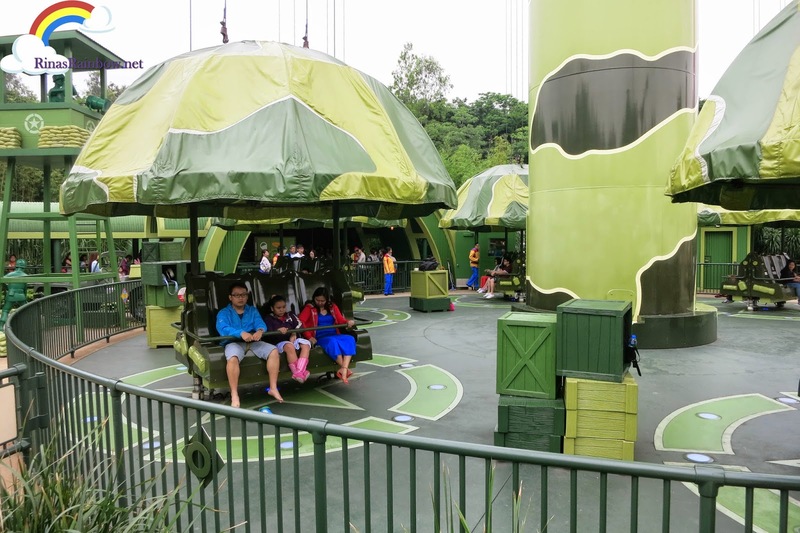 The place is splashed with camouflage patterns! 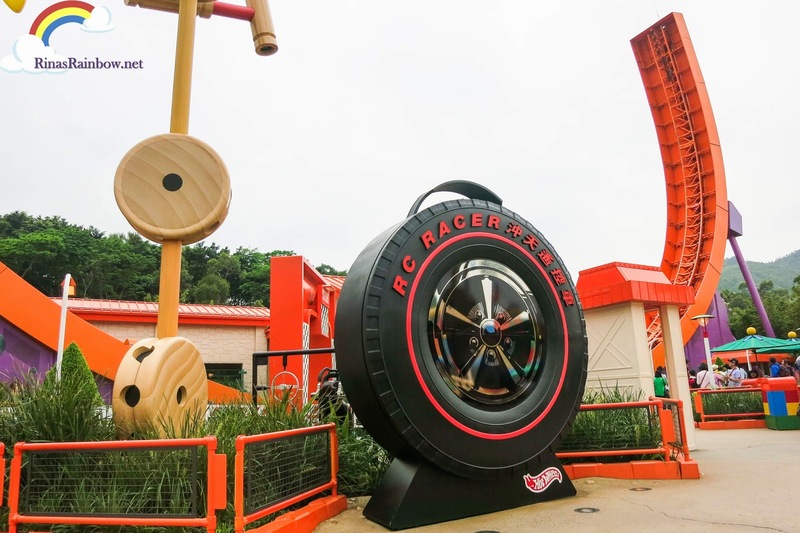 The next major ride is the RC Racer. It's Andy's fastest toy car. 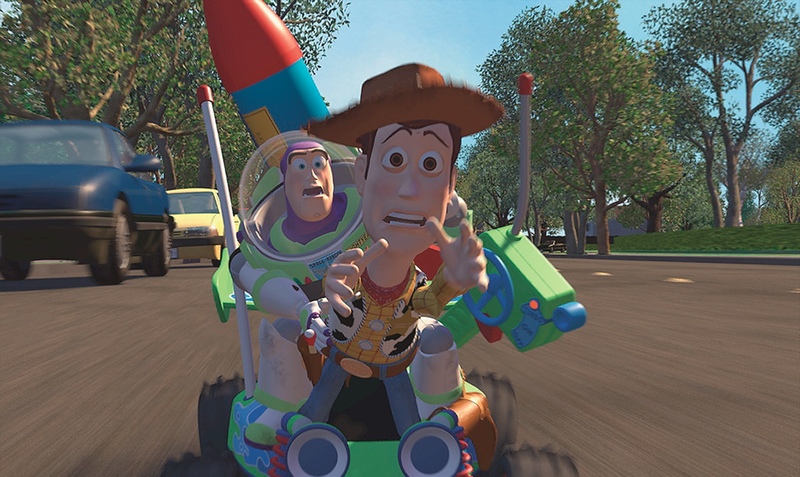 It's that remote control car in Toy Story 1 which Woody and Buzz rode on while they were trying to catch up with the mover truck. Get ready to get zoomed back and fourth in this speedy ride! 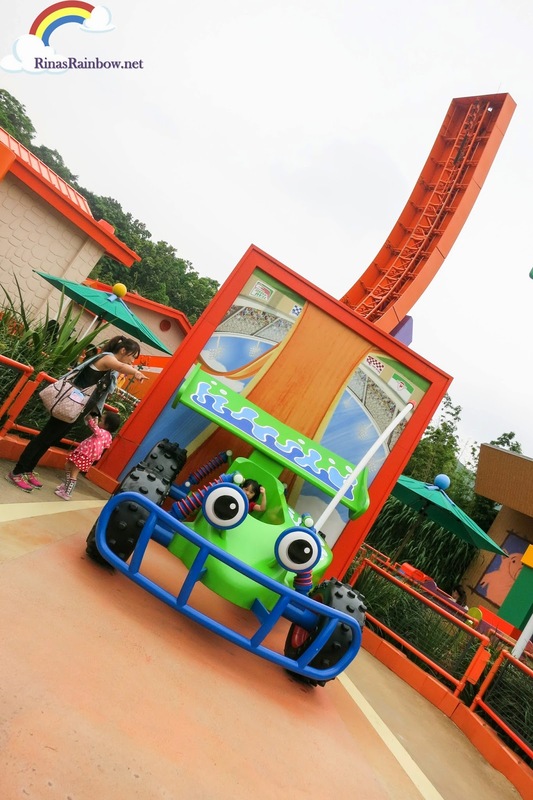 It's has a 27 meter high U-shaped coaster track that goes back and fourth at thrilling high speeds! Richie and I didn't go on this ride for fear that we would get dizzy. (Back and fourth movements make us nauseous, most especially Richie). 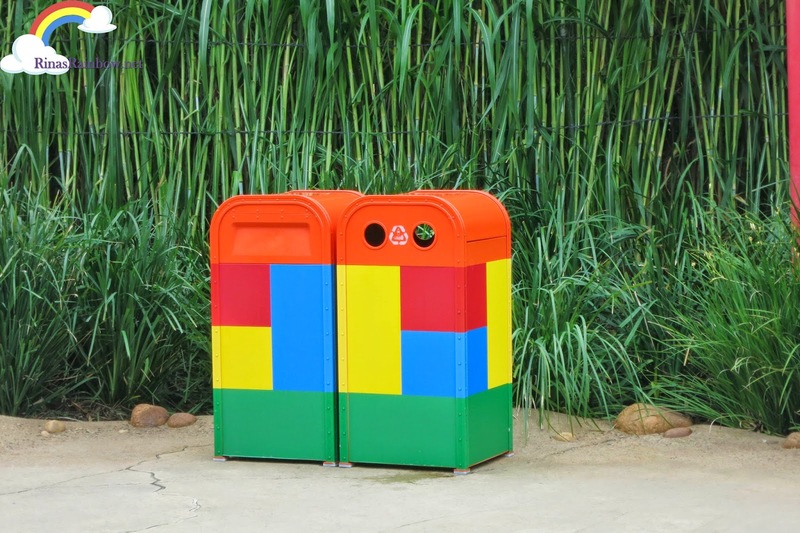 But Rain's cousins really enjoyed it! Another cool detail in this ride is the huge fast-slow switch. This made the ride look like a real toy! 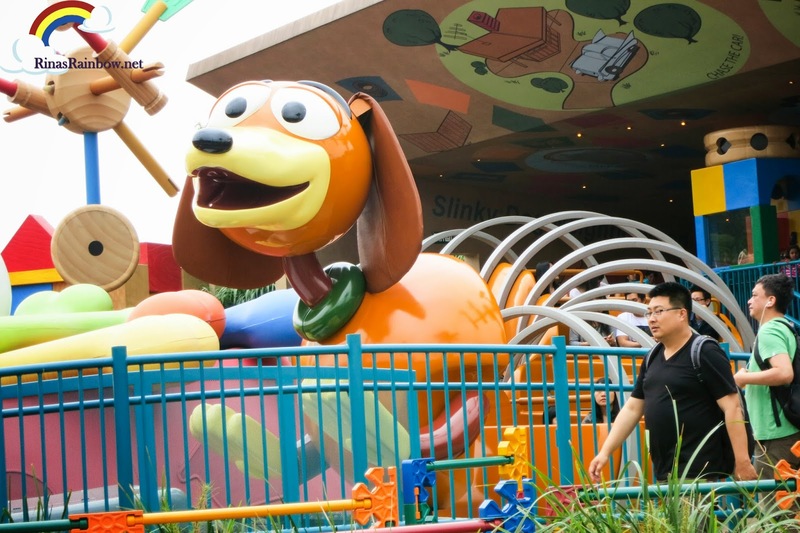 This faithful dog toy has his own ride too! 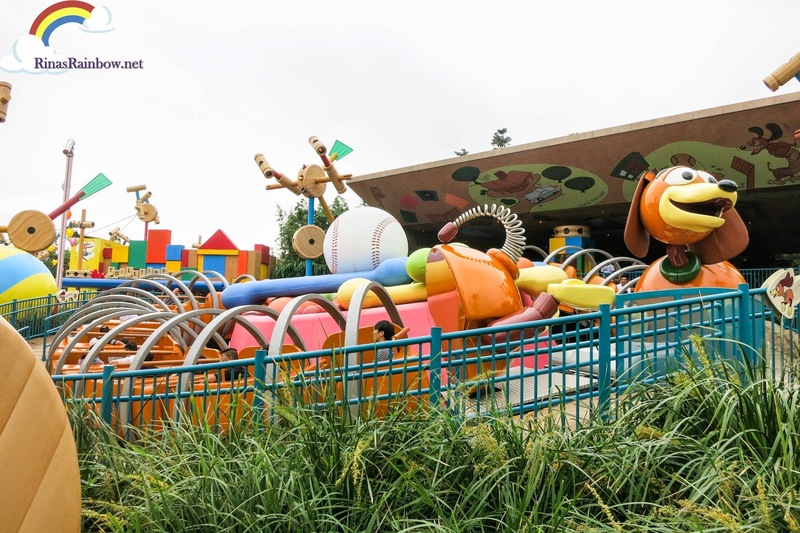 The Slinky Dog Spin! Hop on as he goes in a circular motion as he tries to chase his tail. So cute! 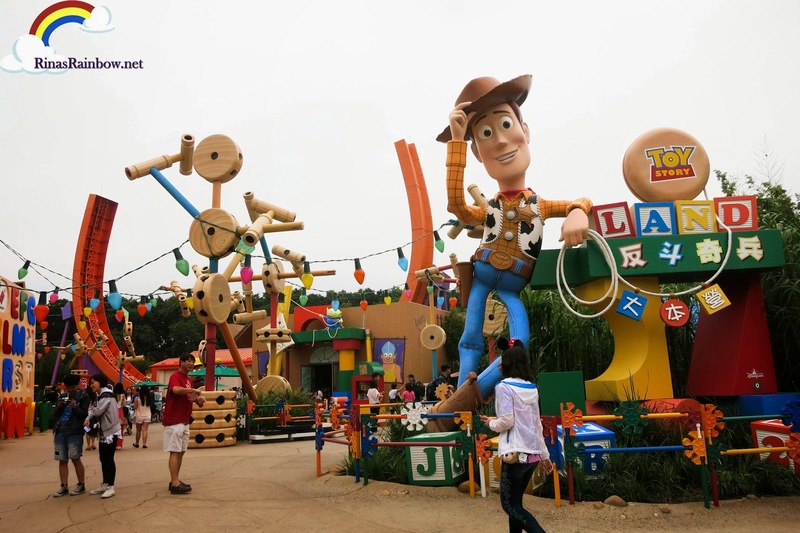 Beside Slinky is that familiar yellow ball with red star and blue stripe in Toy Story. I just had to take a photo. 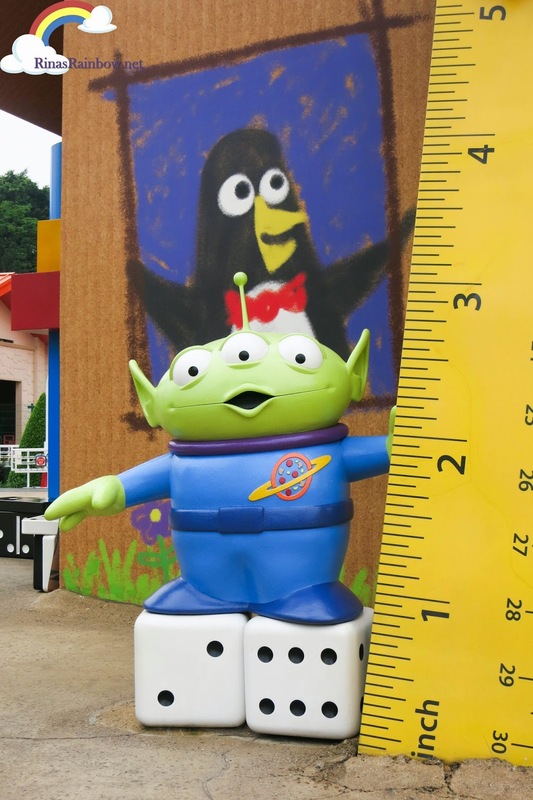 Toy Story Land's photo op area is really cute! It's a Barrel of Monkeys container half burried on the ground. 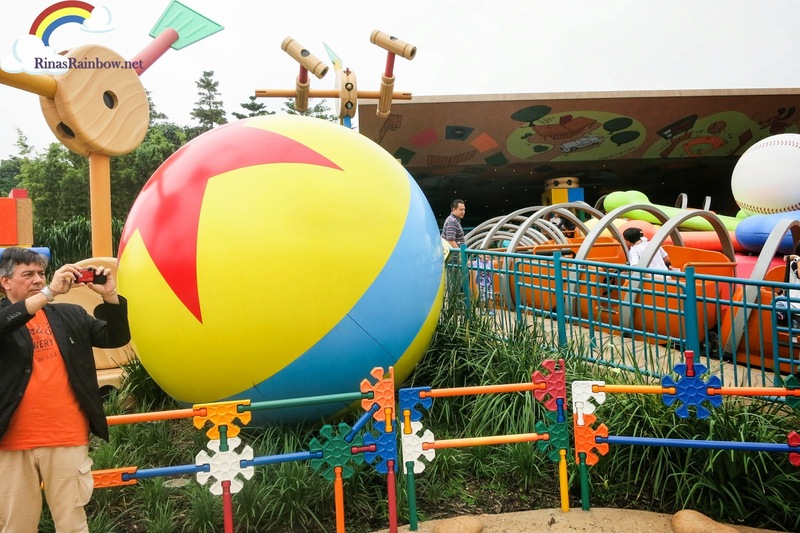 Inside you will see Toy Story Land characters waiting to take a photo with you! 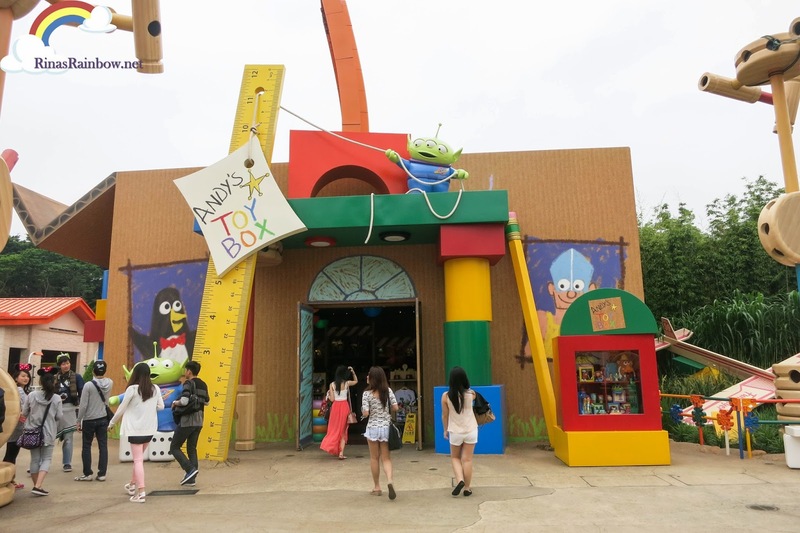 Andy's Toy Box is literally a huge box where you can buy lots of toys and souvenirs. 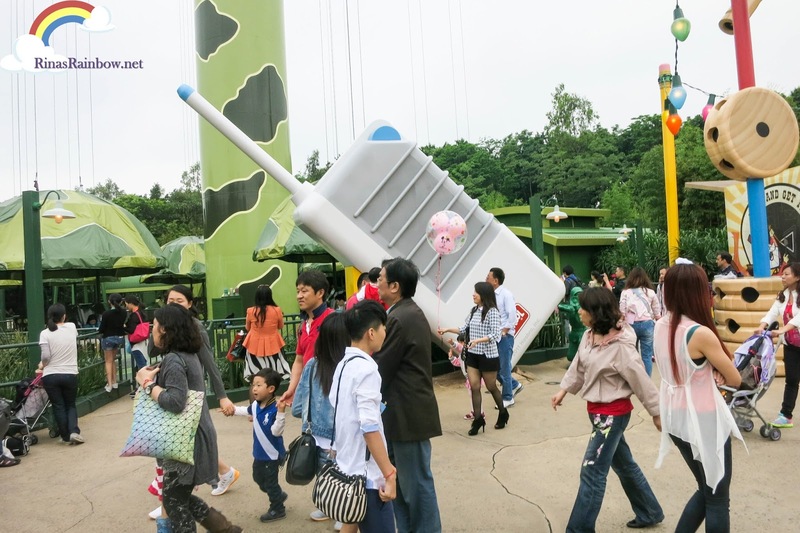 Again, I was so amazed how this gift shop really looks like a real big box! 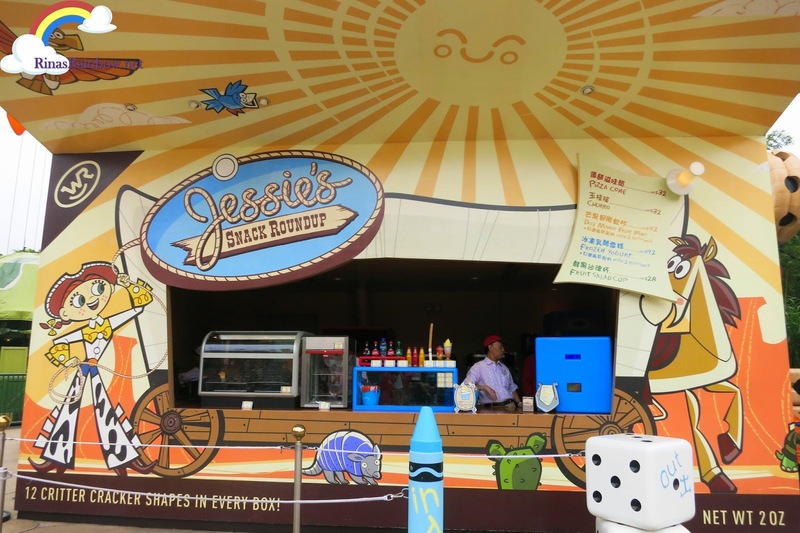 If you feel like a snack from all the fun playing, drop by Jessie's Snack Roundup and load upon yummy snacks like popcorn, pizza cone, fruit cup, frozen yogurt, and what looks like fruitcicles. Notice how healthy these snacks are! 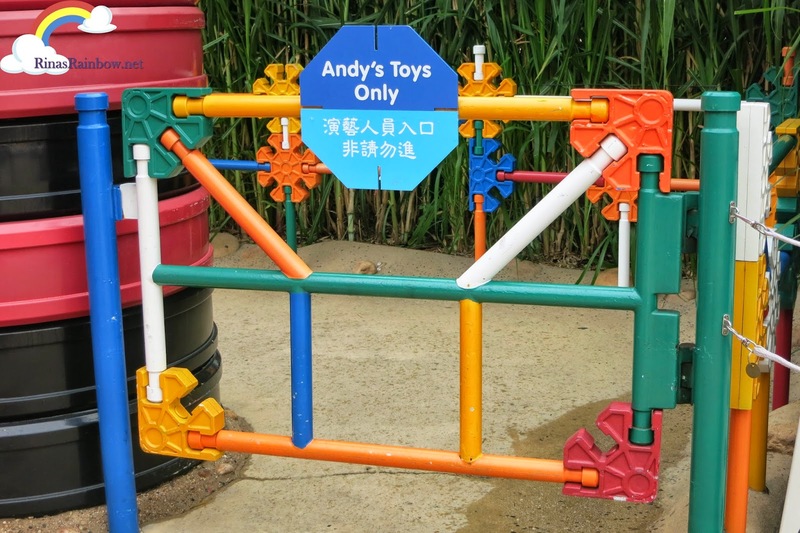 I noticed this small gate near the Barrel of Monkeys where, from time to time, Andy's toys come out. 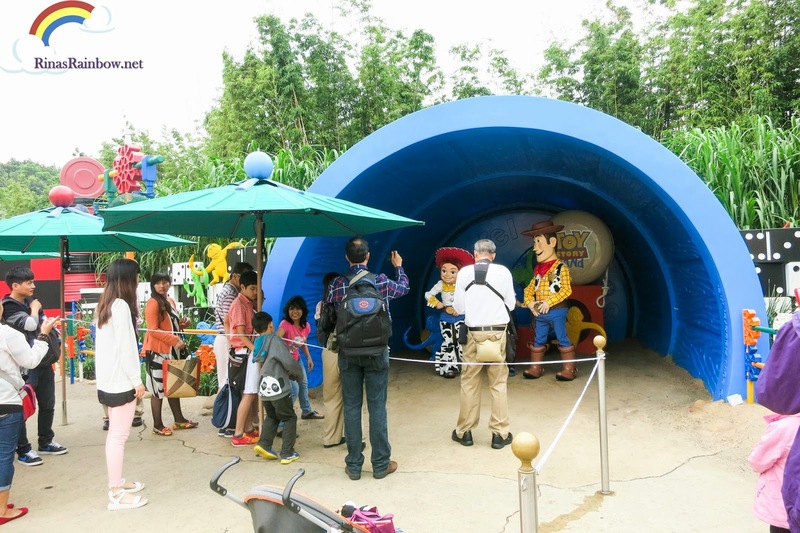 I guess this is where Woody and Jessie take breaks. This is also where Cubot stays. 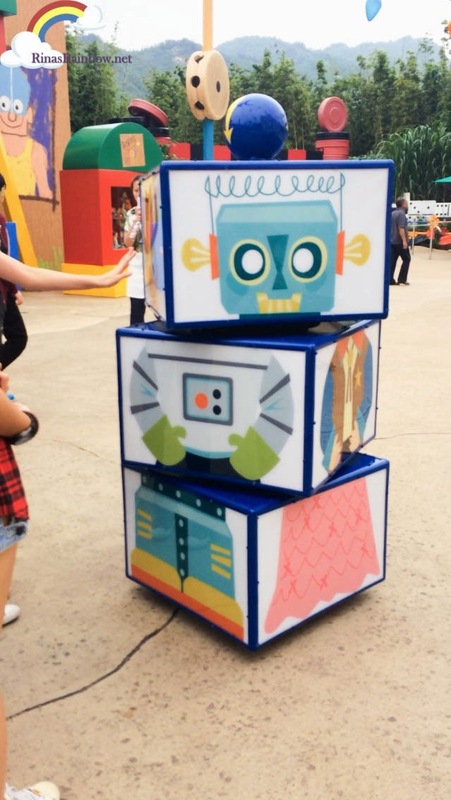 Cubot is a roaming interactive robot with spinning cubes so you can play picture matching games. It just walks around with out a care in the world, just wanting to play with you! 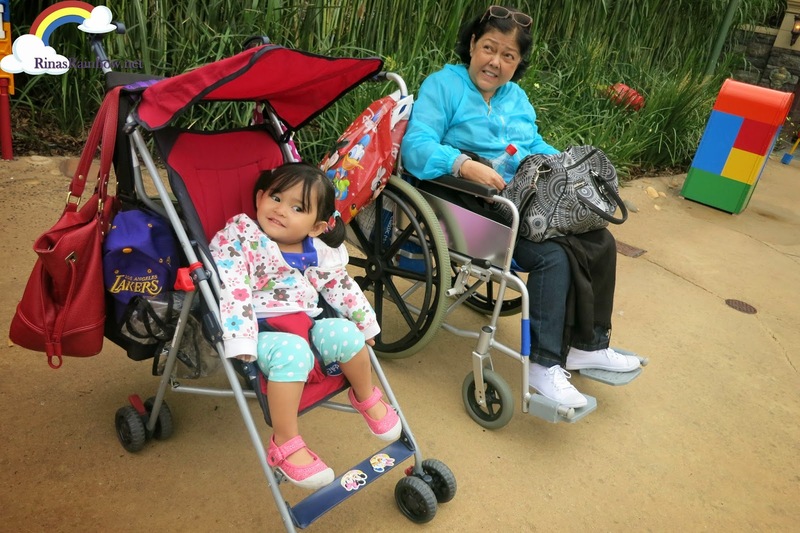 My little Rainbow with her Bita (grandma) are also both mesmerized by this fun toy land! 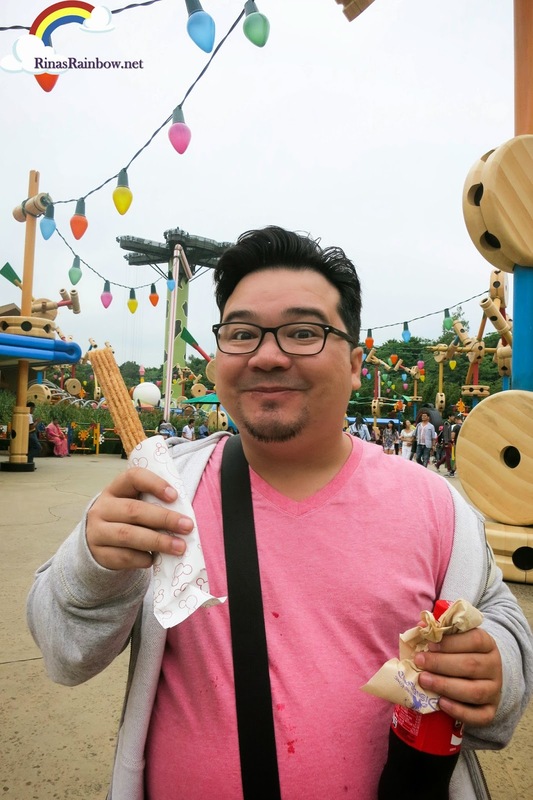 All of the lands in Hong Kong Disneyland has its charms. 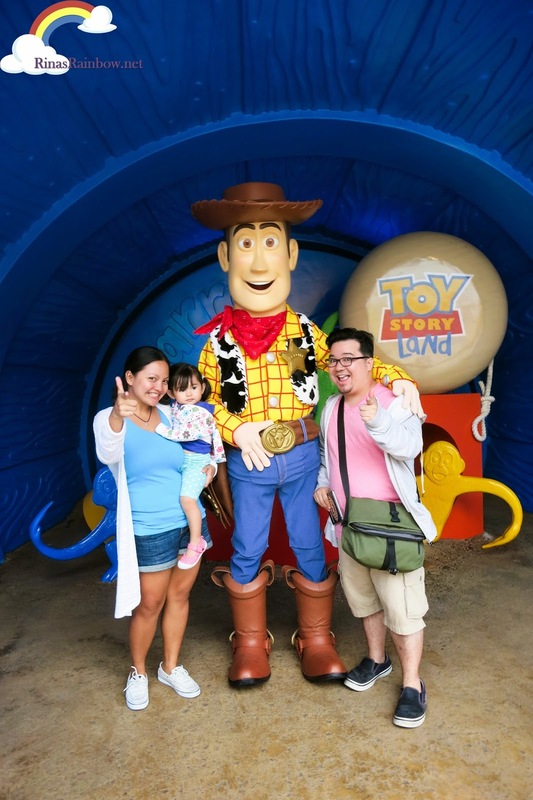 And it's safe to say that Toy Story Land is one of the most fun places I've been to! 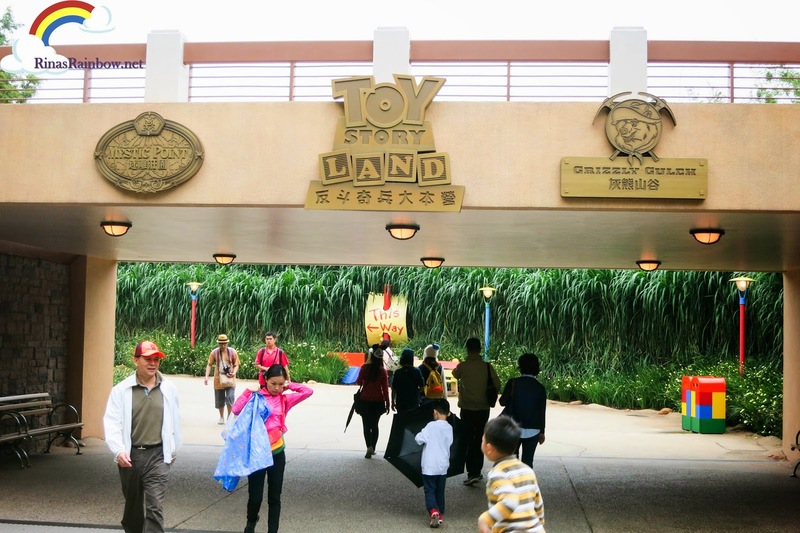 This wraps my Hong Kong Disneyland post on the new lands. 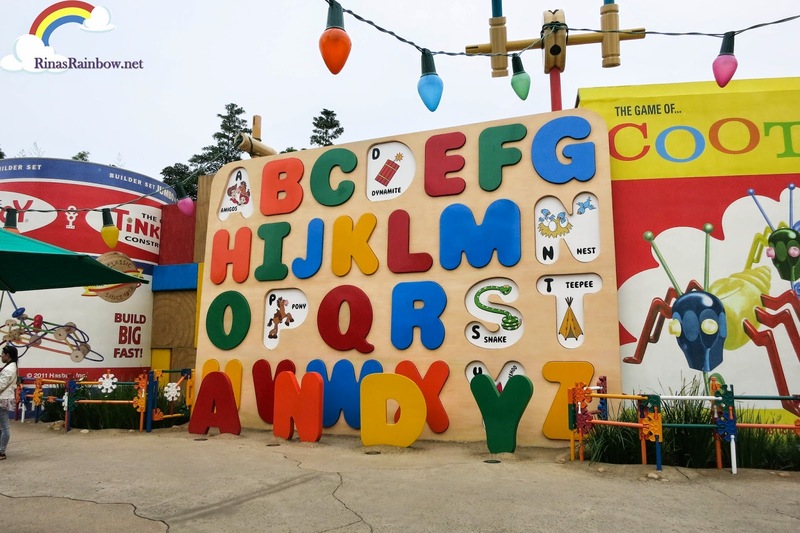 Mystic Point, Grizzly Gulch, and Toy Story Land are all winners and I can't wait to go back!